Swissterminal is switch its service connection from the inland hub of Duisburg to Neuss Trimodal. Swisstrain customers benefit from high frequency links to various terminals on a regular basis. Swissterminal teamed up with the logistics provider Optimodal Nederland. The Swisstrain, a transportation product offered by Swissterminal AG, of Frenkendorf, Switzerland, os expanding its service portfolio. Beginning today, the train will serve the Port of Antwerp in addition to the Port of Rotterdam. Swissterminal will switch its service connection from the inland hub of Duisburg and will use the hub Neuss Trimodal to offer reliable and efficient links to two of Europe’s most important sea ports. Customers of the Swisstrain will continue to benefit from the many advantages a hub offers, such as for example a high frequency of links to various terminals on a regular basis. Swissterminal has also entered a partnership with the logistics service provider Optimodal Nederland B.V. By teaming up with Optimodal as an import agency, Swissterminal is present at the major transport hubs of both Rotterdam and Neuss and information, for example pertaining to the seagoing vessel, can be delivered quicker. The Swisstrain will continue to connect the terminal in Frenkendorf three times per week and the facility in Rekingen twice per week with the respective sea ports. The link with the Port of Rotterdam is offered either via a pure rail connection or through combined transport using rail and barge. The Maasvlakte terminals, ECT-Delta, APMT 1 and APMT 2 as well as RWG and Euromax in Rotterdam are served by rail via Neuss according to the new schedule. If preferred, the Maasvlakte terminals can be reached by barge as well. The city terminals Uniport, Waalhaven, Botlek and RST are connected by barge three times per week. 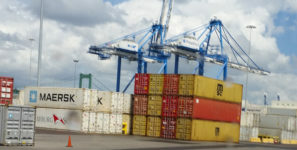 The Antwerp service operates with two barge departures per week and serves five terminals at that port.